Hello and welcome to our monthly Blog Hop, the last one in 2016. WOW, where has this year gone? I am however ready, and will happily put this one behind me, cannot wait to see what 2017 will bring,...For sure it will be a better one :). I kept it quite simple, (no wonder after the mammoth task getting the folds right, I was frazzled) but because of the funky folds it didn't really needed much to looks gorgeous. 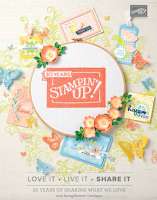 I love this years Paper Pad Warmth&Cheer and its an incredible price right now at only £4.50 for 48 sheets. 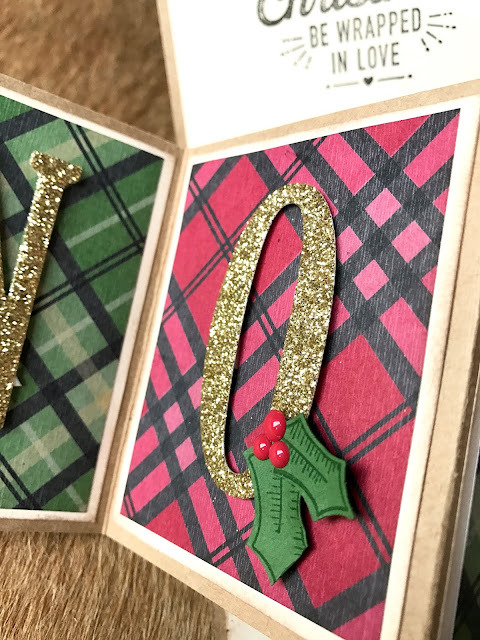 The fab Large Letters of course, pop in gorgeous gold glimmer paper, my fave for adding a bit of sparkle, I very rarely make anything without a hint of this card :). I ended up skipping a layer of card on my project. As I looked at the middle section shape I realised it looked like a house shape. So instead of wrapping it with another folded bit of card, I just went ahead and finished it off as it was. Held the card in place with a belly band, made out of some stamped Kraft Cardstock , some vanilla satin ribbon, gold thread and a sentiment. The shaped layers were cut with the new, and oh so fabulous Stitched Framelits, currently out of stock, but let me know if you are interested in them and I can keep you informed once they are back. 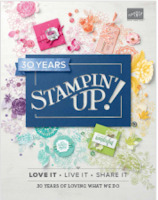 And then as a last flourish I used another fave of mine, the gorgeous Holly Punch and matching Hooly Berry Happiness stamp set. I never want this combo to retire its just so easy to add a quick oomph to everything festive. Sorry, what did you say? where did the gorgeous red berries came from?? Ah, they are these little cute Brights Enamel Shapes, aren't they the perfect finish?? . Thank you so much for stopping to visit me today, I hope you are not too busy to carry on hopping while soaking up some more inspiration using this fabulous fancy fold. Hope over to my friend Tanja to see her beautiful creation. ooooooooooooh I love it! 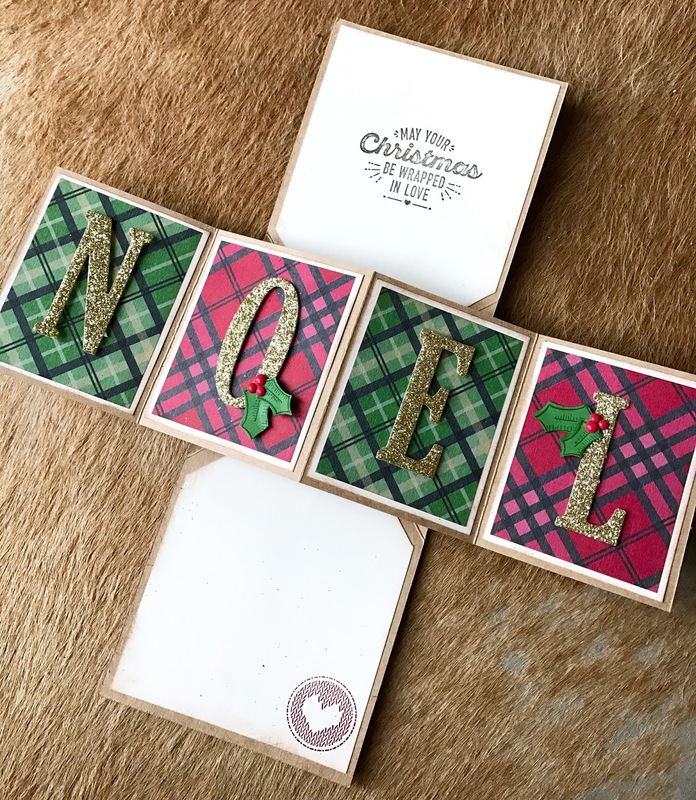 what an original shape you made, and with the plaid background, such a warm and cosy feeling! Love it!! 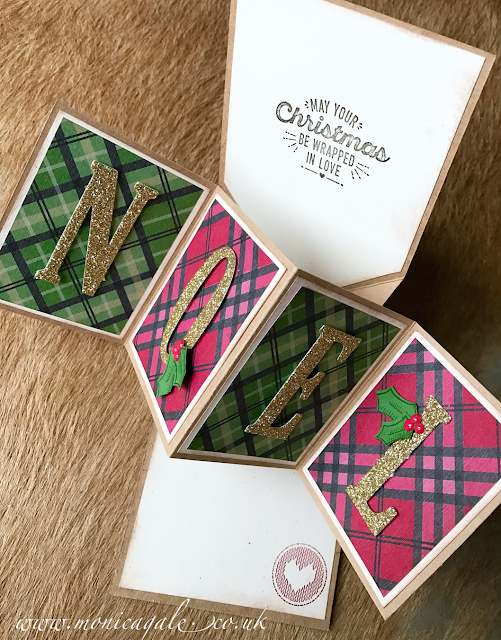 I adore your card Monica - love the idea of the boxes through the centre - ingenious! I found it quite simple so glad that you enjoyed it in the end. Love, Love, Love this card! 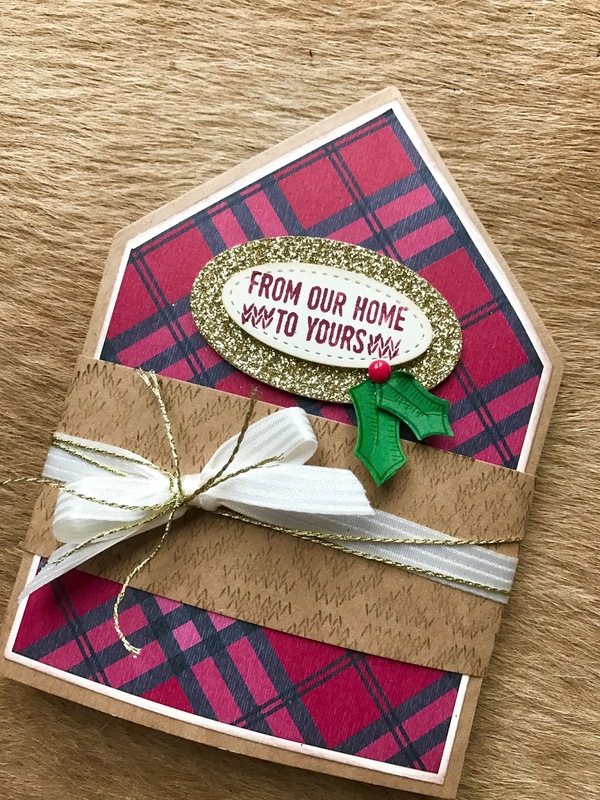 Wowza my friend, such a gorgeous card :-) I love how you turned this fold into a little house. Gorgeous Mon but it does look a bit complicated to make! love it! I love that you kept the shape, perfect for a home!